Hi Dirk, Happy New Year! Sorry, I cannot understand your video because it is not in English. However I made no mistake. Imagine that the changing magnetic flux happens on a constant rate for say 10 seconds. During that time you are effectively in the DC domain. Hallo Mr. Florin, I wish you a very happy new year too! It is easy to switch on the English subtitles. Below the video, you have a "display bar". On the right, you have an icon to switch on the English subtitles. Normally the subtitles start automatically, but if they don't, you can handle this manually. 1. straw man argument. The Lewin experiment is supposed to be done in the DC range with an increasing magnetic flux of constant slope, not with AC current. 2. The A,B,C,D connections are not clearly traceable in the video. There is a tangled mess on the table and a camera has to be placed directly above the table with a person clearly tracing the wires, otherwise it is easy to fake any results you like. 3. the missing negative pulse. I suspect you measure only the positive signal and on connect (BC and DA) and on disconnect AB and BC. If so the math of zero total voltage is bogus as it does not happen at the same time. 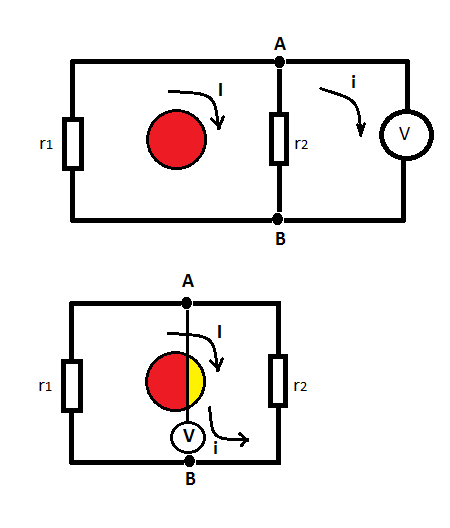 The voltage on AB and BC can be induced from the magnetic changing field from the ABCD loop itself. 4. the explanation on 1:13:00 is completely wrong. Here you are arguing against a mathematical theorem: Stokes theorem with a bad example. What counts is the total magnetic flux through the surface. When you place the coil generating B in the middle most of the magnetic field closes on itself and the total flux (to any surface encompassing the big wire loop) is close to zero. Now there is a simple falsifiability test. I will admit I am wrong if you can derive Kirchhoff's law in the case of a DC circuit from Maxwell's equations when a changing magnetic flux going through your circuit - it can't be done, is a mathematical impossibility. Alternatively I will admit I am wrong if you do a DC experiment (in a way which can be repeated by any critic - I do have access to an electronics lab and I will be able to recreate it) and show a drop in voltage in between the resistors. Very sorry for professor Lewin: he understands only one aspect of Faraday's law when he defines the EMF only in the resistors. He apparently can not distinguish between cause and effect . The EMF is the "cause" (of the induced current) and this same current, passing through the load resistor, creates the voltage drop across the resistor. And that is the "effect". For him an EMF is something like a ghost, coming from nowhere, invisible, having only an effect , but for the rest at least incomprehensible "to someone with very little knowledge of physics" like me and Dirk. Thank you! in 2: must be <> I forgot: "plane"
If you apply Ohm's law on a zero-Ohm wire, carrying an EMF and pretend that this should result in an infinite current, then again, you see or miss half of the picture, because the current is determined by the load resistor. You can not apply Ohm's law to one half of a series circuit and deny on the other part. If you have ideas for additional measurements that could be done on the REAL LEWIN COIL , please let me know. I'll do what you want to see and show it in a next video,so that everyone and also professor Lewin can benefit from it. You stated: "If you apply Ohm's law on a zero-Ohm wire, carrying an EMF and pretend that this should result in an infinite current, then again, you see or miss half of the picture, because the current is determined by the load resistor. You can not apply Ohm's law to one half of a series circuit and deny on the other part." I am confused, this exactly is my criticism of your explanation. Ohm's law applies universally. In the wire with zero resistance there is no voltage drop. Pick any two points on the top wire and connect a voltmeter to it in such a way that it will not intersect the magnetic field. You will get a measurement of zero. In your particular setup you will get a non-zero voltage because your coil under the circuit is the size of the circuit and you will catch a changing magnetic field. Make the circuit say 10x larger and reduce the diameter of the coil say by 10 times and you will not pick up any voltage drop on the top wire. I know this post is a little late, but how can you have current flow though a wire with zero resistance if there is not a potential difference across it? Does that mean a zero resistance wire acts as a open contact? I also hear arguments about how others have shown that Kirchoffs rule does work but are criticized for not following Walter Lewins example. Why are these experiments constrained to limits set forth by Walter Lewins. Either Kirchoff rule does not apply or does. I must be one of the ones that have a religious belief that Kirchoffs rule applies in the example he demonstrated in lecture 16. Why do I believe this? 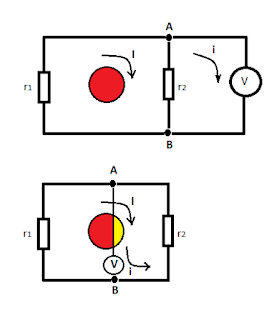 The induced electromotive force has to be reduced to 0 in a circuit, if not the current will continue to flow. It seems to me that what Walter Lewin is shown as EMF is the voltage drop. If what I am saying is wrong, I have a great idea, Take out the resistor 2, and then we will gain voltage in absents of a magnetic field. In my mind the induced EMF, which I consider the induced electric pressure, is dropped across the resisters that the current flows though. Please tell me how this is wrong?